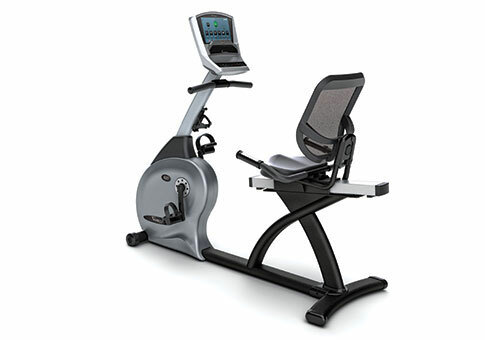 The Vision exercise bikes are a step up from the usual models with enhanced design and functionality. Although the R20 is the entry-level model, it doesn't skimp on features. The R20 has a modern look and feel and features a step-through design so you can easily get on and off the bike. There are three different console choices: Classic, Elegant + and Touch + so you can choose the one that appeals to you. Check out this popular recumbent exercise bike on sale now! The Vision exercise bikes have always been well received, and the R20 recumbent is no exception. These bikes are the higher end version of Johnson Health & Fitness' other popular brand Horizon. As we mentioned, the R20 has a very nice, new look to it, with a steep-through design for easy access. It features a Comfort Arc seat which provides good lower back support. 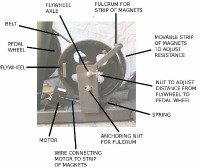 There are up to 20 different resistance levels to choose from, and transition from one to the next is quiet and seamless with the ECB (Eddy Current Brake) system. The real allure of the Vision lineup lies in the ability to choose the console that you want. This determines what features and capabilities you get, so it's definitely an important decision. The Classic console features a large LED display, 7 workout metrics, 5 programs, USB port, contact/wireless heart rate monitoring and Passport TV maps that sync with your own television. This is just fine and gives you plenty to work with. However, the touch screen consoles give you a lot more to work with, so if you can swing the additional expense you'll be much happier with the workout experience. The Elegant + console is a step up from the Classic, with a 7" high definition touch screen, 19 workout metrics and 13 programs including the patented Sprint 8 interval training for burning fat. You also get a free wireless chest strap, Virtual Active Video Integration, ViaFit tracking. Stepping up once more you have the Touch + console, a 10" high-def touch display which gives you everything the Elegant + console offers, plus 4 additional workouts, speakers and iPod music integration. Our test model had the Elegant + console and it was very similar to the touch screens we use at the gym. This one is probably your best bet unless you want to have the music feature built in. 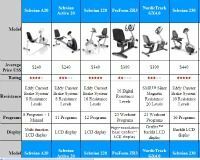 Regardless of which console you choose, the Vision R20 recumbent exercise bike is a great choice. It provides quiet, smooth workouts with plenty of adjustability to create the perfect fit for you and other riders in your family. If you have the money to afford a Vision bike, you really can't go wrong. They are certainly on the pricier side, at about $1200 or so for the R20 on sale, they are built strong and built to last. We'd definitely opt for either the Elegant + or Touch + consoles if possible, as they give you a lot more workouts to choose from plus the ability to track and watch high definition courses which adds to the enjoyment of your workouts, which will ultimately motivate you to work out more often. Sprint 8, ViaFit, Virtual Active and Passport are unique features that you won't find on other bikes, and make Vision stand out from other brands that don't have nearly as many offerings. The Vision R20 recumbent is a winner, and is one of our Best Buys in the price category.